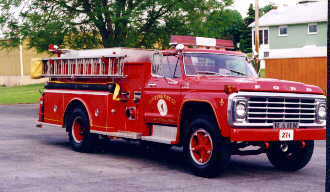 use of its hose carriage to the fire company free of charge for such a period as it may desire. The three  story concrete block and brick building was constructed by the Avon Hall Assoc. tapping the bell. In September 1946, an electric siren was installed on the top of the building. The bell was then used only for meetings until 1956.
store which was one of its largest sourses income. LaFrance in November 1953. The new engine was equipped with the latest firefighting equiptment. In October 1955, a building committee began to formulate plans for a new fire company building. the new building was held on May 4, 1958.
protection rendered by them day and night. 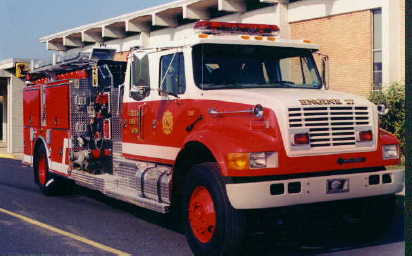 The 1999 New Lexington 1250GPM Pumper is the NEW "ENGINE 27"
More information will be put on a new page by itself soon! We no longer have Engines 27 and 27-1! 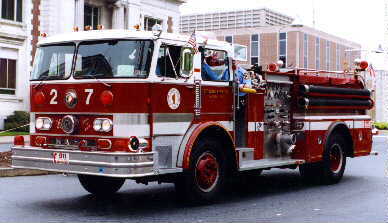 Engine 27 went to Alabama, and Engine 27-1 went to Arkansas.